Now’s the time that every student and parent dreads – having to write that check for college. It’s expensive. There’s no denying that. And when it comes to the discussion about how to pay for school, inevitably the question of taking out private student loans comes up. Private student loans are always a touchy subject. There’s a camp of people that think private student loans are terrible tools and that nobody should ever take them out to pay for college. On the other side, there are banks and refinancing companies that promote private student loans as a lower-cost alternative to Federal student loans. As a parent or potential borrower, which is it? It’s a tough question and there is no right or wrong answer. Scratch that – there are some wrong answers and situations when private student loans never make sense. However, there are also scenarios where private student loans do make sense. We’re going to break down everything that you need to know about getting private student loans to pay for college. From how they work, to what you need to know about repayment, we cover it all. Private student loans are loans that are used to pay for education and the related expenses. They are issued by banks, companies, and credit unions – not the government. Private student loans are more akin to a car loan or mortgage than any other type of debt. That might sound shocking, but when you think about it, it makes sense. When you take out a car loan, and you fail to pay it, the bank repossesses your car. If you buy a house with a mortgage and don’t make your payments, the bank forecloses on your house. Well, a private student loan is backed by your earnings – the collateral is what you’re going to make in the future. The bank is willing to lend you this money for college, because statistically a college degree boosts income potential. As such, you have to realize that if you fail to pay your private student loans, your lender can garnish your wages and more. However, what makes student loans different from other types of debt is that, unlike credit cards or car loans, they typically cannot be discharged in bankruptcy. As long as you have the potential to earn income and repay them, a bankruptcy judge will not wipe out your student loan debt. So when you take out a private student loan, you’re going to have to repay it. Private student loans are loans, and you’re borrowing this money and will have to repay it. As such, you need to know exactly what type of agreement you’re getting into. When looking at a private student loan, here are the key terms that you need to look at. Interest Rate: The interest rate is the rate that interest will accrue on your loan. The lower the interest rate, the less you’ll pay “extra” to borrow this money. For example, if you’re interest rate is 1% and you borrow $1,000, you’ll pay $10 per year to borrow that money (this is an oversimplification, but it works). The interest rate is one of the primary factors you should consider when taking out a student loan. The lowest interest rate will typically always be the best loan. Term: The term is the length of the loan. Many private loans have standards terms, such as 10, 15, or 20 years. Different lenders offer different options. Along with your interest rate, the term really determines how much you’ll pay monthly. The longer the loan, typically the lower your monthly payments will be. Fees: Some loans charge fees to process the loan. You really need to read this carefully – they may be called origination fees, processing fees, document fees, and more. Many of the best lenders charge no fees to get a private student loan, so if you see fees, you probably want to run away. Cosigner: Some private loans will require a cosigner to qualify for the best interest rate. The reason for this is because most lenders rely on traditional credit score models for lending – such as credit history and credit score. As someone going to college, you likely don’t have much credit history. Lenders may then ask you to have someone cosign the loan. Cosigning means that this person is just as responsible as you for repaying the debt. If you don’t pay, the lender can go after the cosigner to get them to pay. As such, you really need to be careful when getting a cosigner, and realize that many people are leery of being cosigners for this reason. Some loans do allow for cosigner release, typically after the borrower has made a set number of payments on time (typically 3 years or more). Many lenders offer two types of benefits for their student loans. I’ll break them down into repayment benefits and other benefits. For repayment benefits, you can look for lenders that offer discounts for setting up automatic payments or paperless statements. Some lenders now give an interest rate reduction of around 0.25% simply for setting up automatic payments. Some newer lenders are now offering other benefits, such as job placement help if you lose your job, and more. These are just added perks, and really shouldn’t factor into your decision about whether to get private student loans. Now that you know the key terms and how private student loans work, you may be wondering how you qualify for a loan. Since private student loans operate very similarly to other types of loans, the process of qualifying is similar as well. The credit score is key. Having a great credit score typically means you’ll easily qualify for a private student loan. If your credit score is less than 700, you’re going to run into problems. If your credit score is less than 650, you might be out of luck. We recommend using Credit Karma as a FREE tool to check your credit score – go do it now. The second factor, closely related to your credit score, is having a cosigner for your student loan. If you’re close to meeting the bank’s criteria for a loan, they might ask you to have a cosigner. This is typically a parent, but it can be anyone really. I would say the majority of student loans are processed with a cosigner. Just remember that a cosigner is just as liable for the loan as you are. 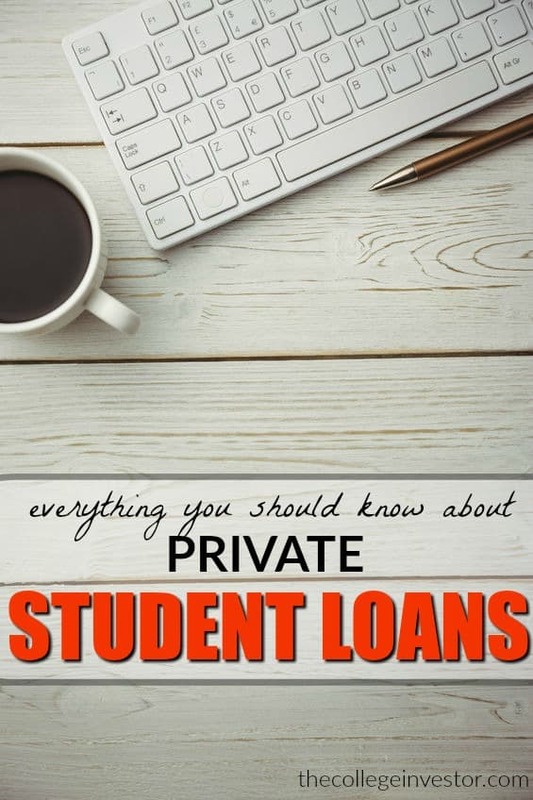 So, now that you know all about how a private student loan works, you probably want to know if you should even be considering it. The answer is maybe. Private loans can serve a great purpose is helping pay the cost of school if you can’t afford it. But before you jump onto the bandwagon, you must do two things. First, you must always do a return-on-investment calculation on whether the cost of college is worth it. It’s sad to think about, but you’re really getting this education to boost your earnings, and it if doesn’t do that, you wasted your money. Plus, you will inevitably need this higher income to pay back your loans! When doing the calculation, I like to keep it simple – figure out the career you want, look up the starting salary of it, and never borrower more than the starting salary of the job you want. For example, if you want to be a teacher, that’s awesome. But you shouldn’t borrow more than $35,000, because that’s the average teachers make after graduation. If you want to be an engineer, you shouldn’t borrow more than $64,000, because that’s the starting salary of an engineer today. Second, you should exhaust all of your Federal borrowing options first. Federal student loans are amazing tools to pay for college. They typically offer better interest rates, repayment plans, and forgiveness options. We break down the full amounts you can borrow and the types of loans offered in our Definitive Guide To Student Loan Debt. Since this article is about private loans, we’re not going to go into too much depth on Federal student loans. Just realize that you should be maxing these out first before considering a private student loan. 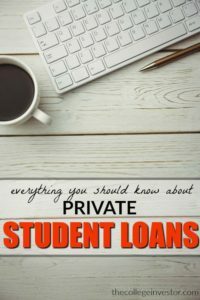 Now that you when to consider a private student loan, I want to share with you the most common scenario when private student loans make sense. It’s the scenario of going to medical school. We’ve talked about student loan options for doctors before, but let’s look at the scenario for private loans. Going to medical school is expensive – doctors can expect to spend $180,000 or more on school. But doctors can also make a lot of money after graduation. Let’s look at our rules. Rule number one is that you should consider the after graduation salary. For doctors, after they are residents, they can expect to earn $200,000 or more. That’s a great salary and means they can handle a large amount of student loan debt. What about Federal loans? Well, doctors should definitely max out their Federal student loans. The trouble is, that Federal loans let you borrow a maximum of $20,500 – and doctors may need more. In this scenario, private student loans make a lot of sense for filling in the gap between tuition and what Federal loans go towards. Furthermore, there are lenders that specialize in lending to doctors and lawyers, because of the uniqueness of their situations. If you’ve decided that private student loans are right for you, it’s essential that you shop around for the best loan. When shopping for a loan, the interest rate and term should be the #1 and #2 priorities. I suggest that you start in two places when it comes to shopping for a private student loan. First, check with your school’s financial aid office. Some schools have preferred lenders, which offer discounted interest rates and terms for their students. This can provide great savings. Also, you should look at a comparison engine like Credible. Credible will shop multiple lenders all at once, and provide you with the best interest rate and fees that meet your situation. You can also compare all of the major student loan lenders via our student loan tool. The key here is to shop around. Don’t just do one loan because someone told you to. Find the best loan because it can be difficult to change this later. If you have private student loans, you have to understand how repaying them works. 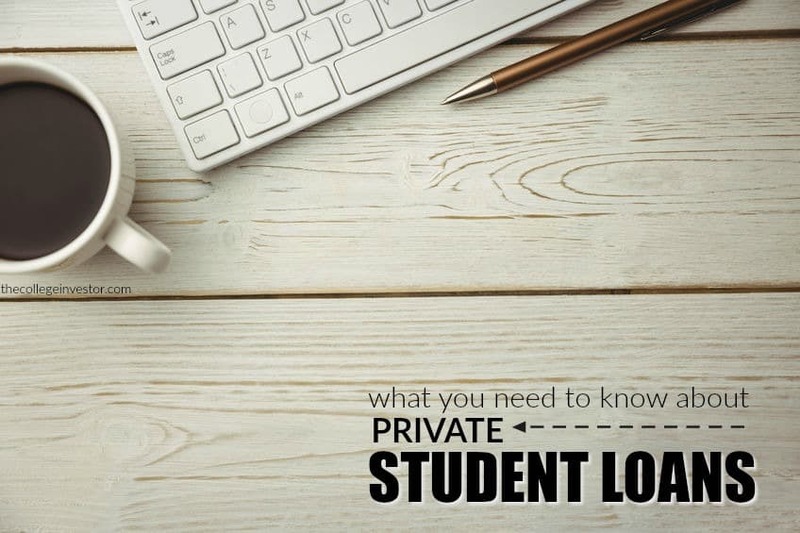 We’ve already discussed the fundamentals a little bit earlier, but let’s look into what to do when it comes to repaying your private student loans. Unlike Federal loans, there aren’t many options for repaying your private loans. If you cannot afford your private student loan payments, your only option is to try and refinance the loan into a longer term so that your payments go down. Some private lenders offer deferments based on your situation, but this is extremely rare for private student loans. Private student loans should be looked at like any other financial tool. They do serve a purpose, but many times they are used the wrong way. As such, if you’re considering private student loans, really make sure that you are following the steps we listed above. Get Federal loans first, then private loans. Always make sure that you are shopping around to get the best interest rate and fees. Remember, you can comparison shop a bunch of different lenders at once using a service like Credible. Do you have private student loans? Are you considering them?